The refugee crisis evokes strong feelings. The chart on this page highlights the emotional journey that many of us are on, plotting our social media responses to major events such as the photograph of the drowned toddler Aylan Kurdi. The feeling that many people have is one of powerlessness, a sense of despair that the scale of the situation is just too big. How can we move on from the sense of paralysis we often feel, the feeling that there’s nothing that we can do to help? Perhaps you could start by wearing the ‘Journey Together’ wristband as the first step towards showing solidarity for refugees, or simply offer your friendship and support. You might even be ready to go a step further and offer a room in your home. Many volunteer and grassroots projects were started by individuals and groups who wanted to help. Perhaps the most effective are the ones that listen to refugees and work side by side with them. You don’t have to start something new, there is a variety of projects and campaigns that would value your involvement. 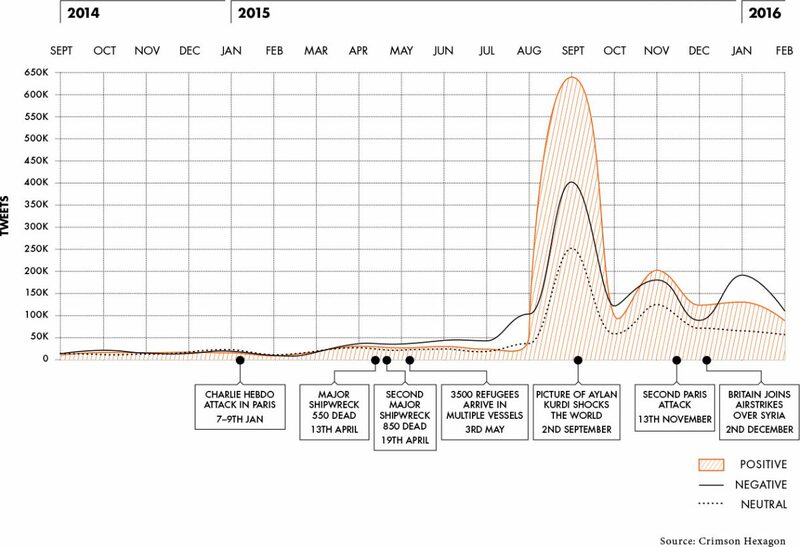 UK Twitter data over the past 18 months reveals how public emotion shifts in response to major events. A network of UK groups working towards resettling 20,000 Syrian refugees by 2020. Organises campaigns and supports local groups who are welcoming refugees in their area. What you can do: Join a welcome group or set one up in your area. Helps young refugees and survivors of trafficking build new lives through education. What you can do: Help mentor refugee and asylum children as they settle into their new homes. calling for potential foster carers for unaccompanied minors. What you can do: Foster an unaccompanied asylum-seeking child. Theatre group operating in the camp in Calais. requests you could respond to. Support local groups, charities and volunteers and provides aid to meet the basic human needs of refugees in a manner which maintains their dignity. What you can do: Donate clothes, blankets and other items, give towards essential items such as tents and clothing for refugees in Calais and in Greece. Organises communities to act together for power, social justice and the common good. What you can do: Sign up to the Homes for Resettled Refugees Register, start a campaign to get your Council to commit to joining the Syrian Vulnerable Persons Relocation Scheme. Provides search-and-rescue assistance to refugees and migrants in distress at sea. What you can do: Donate towards the continuing work of rescuing refugees and migrants at sea. Organises a national instrument donation program providing instruments for musicians living in Calais and to facilitate workshops in which people share their music and learn new skills. Organises convoys of essential supplies from London to refugees in the camp in Calais. What you can do: Donate, fundraise or volunteer. A growing movement of over 30 cities in the UK which are working to build a culture of hospitality and welcome for refugees. What you can do: Donate, register as a supporter of City of Sanctuary or get involved with your local group. Bristol-based group organises meetings with volunteers who want to offer friendship and emotional support to refugees. What you can do: Train as a volunteer, join the B.friend Craft Collective. Works with Syrian refugees and internally displaced people as they rebuild their lives. What you can do: Donate or fundraise. Works with refugees and asylum seekers, supporting them to rebuild their lives. What you can do: Donate, fundraise or volunteer to support the Refugee Council. Help refugees build safe, happy and productive lives in the UK. What you can do: Volunteer, fundraise, campaign and give.